Class members were sworn in as Senators and worked together to build legislation on comprehensive immigration reform – their chosen topic for the day. LSC’s 2018 class spent the day in Boston for Government Day on July 18. 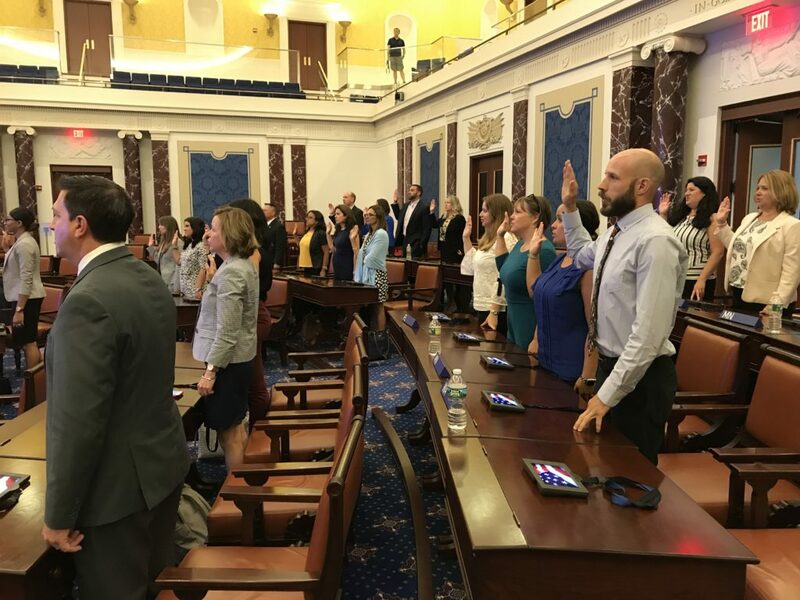 The session included the tradition of visiting the Massachusetts Statehouse to meet with members of the SouthCoast legislative delegation and a first-time visit to the Edward M. Kennedy Institute for the United States Senate for a hands-on senate simulation. It was a one of a kind learning opportunity for class members as the simulation took place in a full-scale reproduction of the U.S. Senate Chamber! A special thank you to Senator Michael Rodrigues and State Representative Pat Haddad for hosting the class, and to State Representatives Carole Fiola, Antonio F. D. Cabral, Bill Straus, and Alan Silvia, and House Speaker Robert A. DeLeo for meeting with us! Check out more photos from Government Day! next post: Attend an LSC Info Webinar!